I’ve been a fan of Neil Gaiman’s writing for years, so when one of my friends asked if I’d like to go to a London screening of a film based on one of his short stories it was nearly impossible for me to refuse. 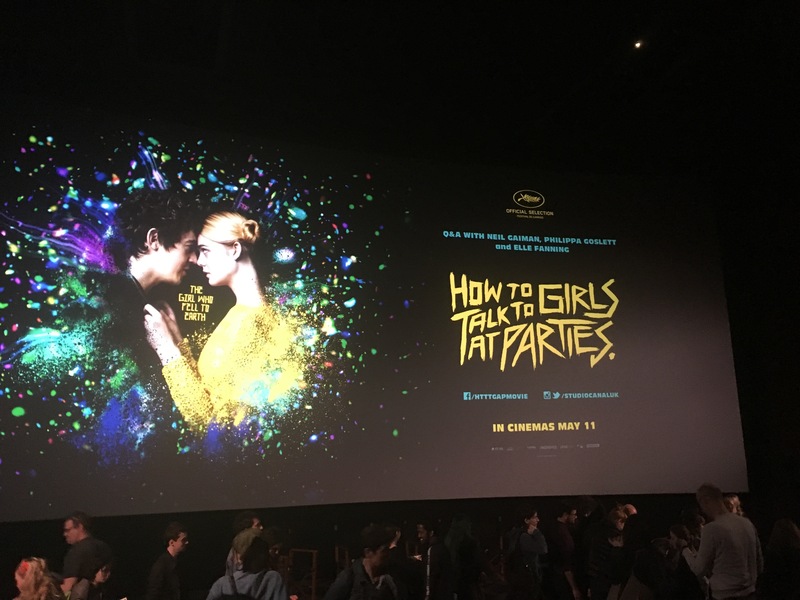 Starring Alex Sharp and Elle Fanning, the film How to Talk to Girls at Parties is based on Neil Gaiman’s short story of the same name. The short story was initially published in the collection Fragile Things in 2006 and centers on teenage boys in the 1970s Croydon as they conclude that girls may as well be from a different planet… and meet some that actually might be. 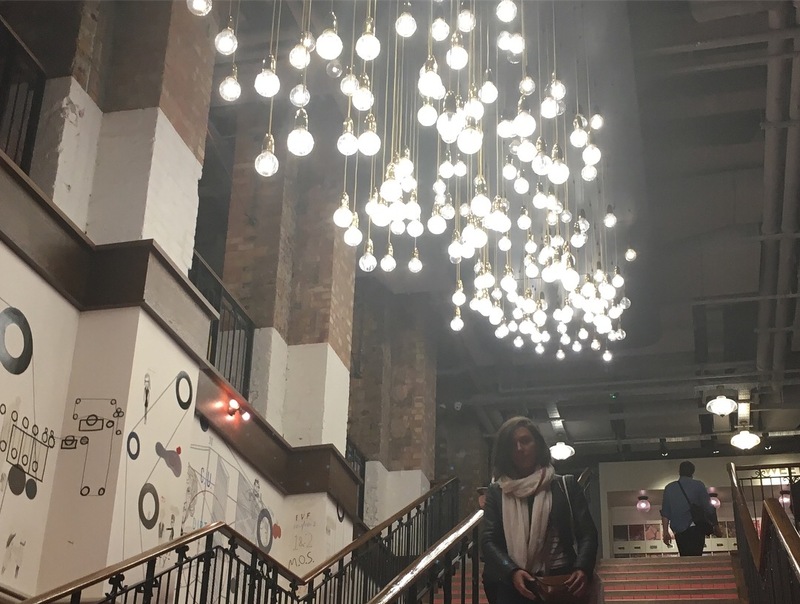 The film screening took place at Picturehouse Central in Picadilly, a fantastic cinema with such a fun atmosphere. I loved how the vibe was a blend of old-fashioned cinema with modern touches, especially with the gorgeous lights and neon signs everywhere. There were even hair stylists doing punk-themed hairstyles before the show (the punk scene is an important part of the film), which my friend and I couldn’t resist agreeing to get done. Needless to say, walking back to the bus stop after the screening with my enormous teased hair was pretty interesting! The film itself was wild, bizarre, and unpredictable–but what else would you expect from something inspired by the brilliantly creative mind of Neil Gaiman? I decided not to read the short story until after watching the film so I didn’t have any prior expectations, but after finally reading the short story it’s safe to say that it wouldn’t have made a difference. The film strikes a perfect balance between capturing the essence of the short story and fully fleshing out the world that the characters inhabit in ways that the reader would never have seen coming. As someone who adores science fiction, I couldn’t help but be captivated by the meticulous attention to detail regarding the film’s alien world. From costumes and choreography to the dialogue itself, no aspect of alien life was left unaccounted for. In the Q&A session following the screening, Neil Gaiman made it abundantly clear that he loves when other creators take inspiration from his work and make it their own. Hearing him speak about this adaptation was surreal in many ways–not only am I a huge fan of his work, but it was also so fascinating to hear his thoughts on something I had just watched. 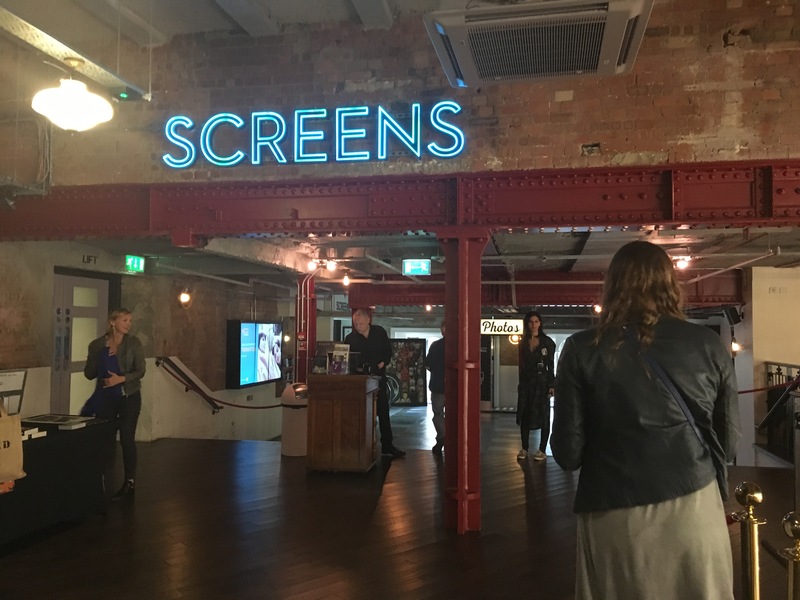 Alongside him on stage were Elle Fanning and screenwriter Philippa Goslett, both of whom offered really great insight as to the creation of the film and their experiences watching it unfold. Weeks have passed since I attended this event but I still can’t believe that I actually saw Neil Gaiman in person–it’s something I never even dreamed of putting on my bucket list int he first place! Thus far, my third term at Oxford has been an interesting balancing act between studiously getting work done and making time for amazing opportunity that I may never have the chance to experience again. Learning when to sacrifice a night of sleep or a few extra hours working on an essay in order to do something like see Neil Gaiman speak is something that has taken time to get used to, but in most cases I think it’s always worth it in the long run. I couldn’t think of a better way to spend a Friday night! 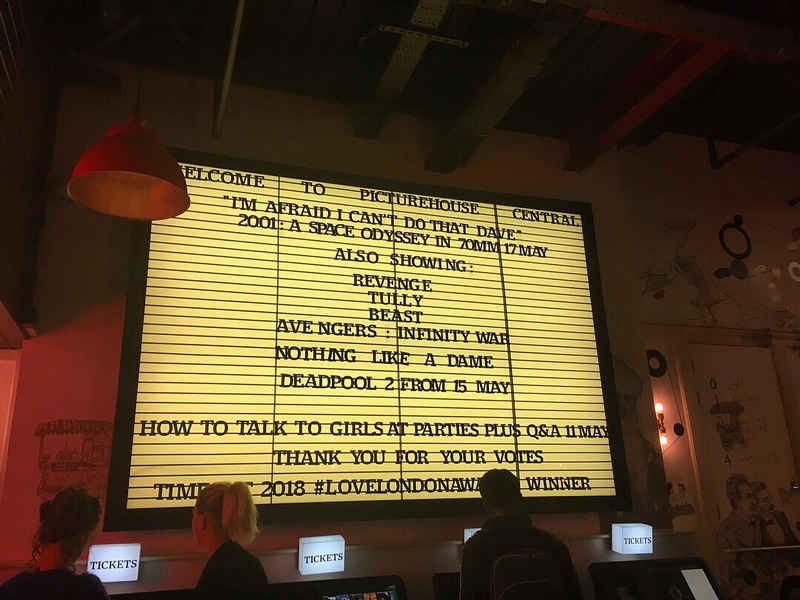 I highly recommend visiting Picturehouse Central in Picadilly if you ever get the chance, as well as reading Neil Gaiman’s short story “How to Talk to Girls at Parties.” And, of course, go see this beautifully bizarre film! Have you ever seen this film, read the short story, or been to an event with Neil Gaiman? Do you have a favorite novel or short story by Neil Gaiman? Let me know in the comments section below! Oooh what did you think of Norse Mythology? Ahh that is so exciting that you got to meet him, Holly, especially since you’re such a big fan of him. I’m so happy for you!! :’) And it’s great that the movie lives up to the book as well. I definitely need to check out that film. I’m also a fan of Neil Gaiman. He became the Writer in Residence at my college like a year after I graduated. I was a little mad! If I’d graduated a bit later I’d have been able to hang with him at campus events, take classes from him, and see him speak… As it is, I can only admire him from afar! I just finished reading The View From the Cheap Seats and can’t quite express how jealous I am that you were able to see one of my literary heroes in the flesh haha. That’s wonderful that you were able to not only go to a screening, but also hear him talk about his art and its influence in others! Wow! This sounds incredible! What a fantastic experience! What you said about learning to find the balance between school and other fun life experiences really resonated with me, because I’ve been trying to find that balance in my own life as well. I love school and I think education is really important, but sometimes, opportunities like seeing a Neil Gaiman movie just can’t be swept aside without us wondering if we’d regret it in the future. 😊 Every once in a while, it’s great to go on adventures that don’t relate to school + just have fun enriching ourselves with something other than textbooks or school assignments. Sounds like it was a fun experience! Glad you got to go and enjoy it! Love Neil Gaiman‘s work. How awesome you not not got to see an adaptation of his work but to listen to him speak afterwards. Thanks for taking us along!